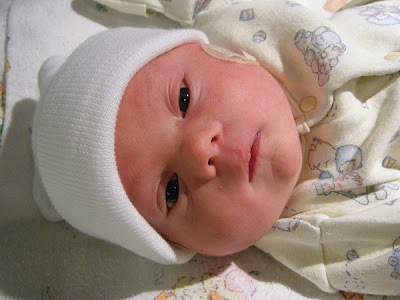 During Spencer's NICU stay, his temperature was checked under his arm, regularly. One or two of my favorite nurses helped me learn to check it, too. The babies have to have at least a ____° temperature before you are allowed to take them out of their warming bed. Sometimes we had to check Spencer's temperature 4-5 times before getting a high enough reading. These nurses often blamed this on Spencer's "fluff." I just thought they were referring to his fat. Being full term (38 weeks, really), he was definitely one of the biggest babies in the NICU! He weighed 8 pounds, 2.5 ounces at birth. Finally, one of the nurses explained something to me that I hadn't read in any book or on any website. Babies with Down syndrome are fluffy. Spencer actually has very thin limbs, compared to my other babies. But he has these fat pockets in his armpits. They make it harder to locate his "core" for checking his temperature. These fat pockets feel... less dense than what you normally find on babies. Look at those irresistibly fluffy cheeks! This "fluffiness" also applies to Spencer's fat baby cheeks. Kissing them, you can feel the difference. His cheeks are softer than other babies! He is... fluffier! The extra tissue on his neck feels the same. This tissue seems to shift / sag more than denser tissue, too. This is really only noticeable on his cheeks.